Discover Fairwinds, just 25 minutes north of Nanaimo. 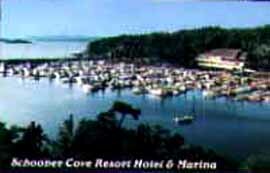 Here you'll find Schooner Cove, our friendly waterfront resort hotel and marina, with comfortable rooms, great food, a pool, spa, and a fully equipped fitness centre. You'll also find the most picturesque 18 holes of golf on the Island, where visitors are always welcome. For tee times at Fairwinds Golf Club, call 250-468-7666 or 1-888-781-2777. Take advantage of our year-round packages for golf, boating, and fishing getaways.